Adames Shifu has a very strong background in traditional martial arts and traditional training. He has studied external and internal Chinese Martial Arts for most of his life. He specializes in traditional methods and forms that hail directly from the Shaolin traditions. He has trained in a wide variety of weapons and open hand styles. He has spent over 20 years studying and practicing a variant of Northern Shaolin Mantis combined with Tam Tui (a family style originating in northern China). 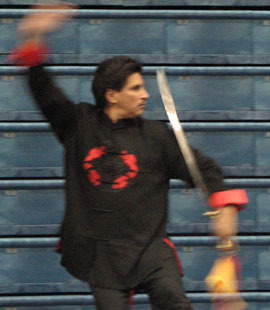 Adames Shifu serves as 老師(Lao Shi - Senior Instructor) of our Kung Fu program. He continues studying and developing his skills while maintaining the traditions of Traditional Chinese Martial Arts. Adames has spent considerable time studying the internal art of Taijiquan(Tai Chi) as well. He continues to study it and its health benefits as well as its martial applications. He currently teaches the 8 posture, the simplified 24 and continues training in the 88 posture Yang family application form. Shifu Adames combines his extensive knowledge with a patient and reflexive teaching style that motivates children through seniors to do their best and improve their health and fitness.